Following the pilgrimage of trust meeting last October in Kolkata, India, a meeting of young people took place in Bangladesh from 15 to 18 February, in the village of Lukikul, close to the town of Rajshahi, in the North-West of the country. Two of the brothers of Taizé who live in Bangladesh were present, likewise several young people from Mymensingh, where the brothers live. Approximately 150 young people from the Rajshahi region took part, from fifteen different villages. These young people belong to various ethnic groups of Bangladesh, in particular Ouraos, Santals and Pahans. The aboriginal population, called “adivasis”, are very small minority in Bangladesh, and are generally much poorer than the Bengali speaking majority. 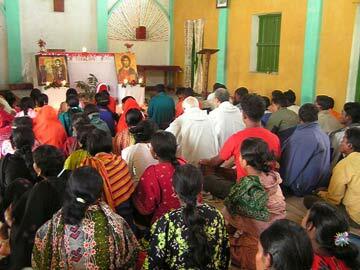 Few adivasis are Moslem; most are animists, Hindu, or Christian. Over sixty of the young Christians who came to take part were already well known! 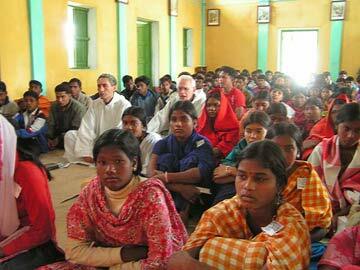 Each of these young people has undertaken a commitment towards the destitute in their village (providing schooling for poor children, accompanying the disabled …) They meet regularly once a month in small groups with one or other of the priests in the area for a time of exchange and Bible training. Other young people came for the first time, because they had heard about the meeting from friends in their village. Among the newcomers, the young Hindus were numerous. The program on the first day was led by some young people from Mymensingh. They proposed reflection and sharing on what the young people in Bangladesh are living today, in the villages, at school, the relations between the young people and their parents, daily life in a society in full economic and cultural transformation… This provided a rare opportunity for these young people from the villages to express themselves and discuss their difficulties and their hopes. On the second day, a priest from Rajshahi, leader of the Diocesan Pastoral Centre, with an excellent knowledge of the Bible, shared in a very lively way on “who” is Jesus for him; what he himself had discovered through the Scriptures of the life of Christ, his words, his attitude towards those he met, and what he still represents for so many men and women today. Among other outstanding moments during these days: a reflexion on the situation of adivasis in Bangladesh today; contributions from people working among handicapped people in the villages … Two young adults spoke of their stay in Kolkata last October, when they went to take part in the international meeting of the “pilgrimage of trust” organized by Taizé in connection with young Christians in India. There were many moments for laughter and relaxation during these days. The parish of Lukikul had only one pump for drawing water, so the young people of the village asked their parents if all the participants could go to the homes each day to wash and wash their clothes. The parish buildings that were used as dormitories had all had been arranged with large bundles of rice straw from the fields surrounding the village. Just before the meeting began, in the small courtyard of the priest’s house, some one had hurriedly dug two large holes to make the traditional kitchen with a wood fire. As there was no electricity in the village, a small makeshift generator had been rented to give a little light each evening. For many of the young people, the great discovery was the beauty of the three times of community prayer, giving the rhythm to each day, morning, midday and in the evening. The songs of Taizé translated into Bengali alternated with traditional bajans (beautiful meditative songs; the phrase is initially sung by a soloist, then taken up again by all the assembly together) and other songs from Bangladesh. In the choir of the church, the “icon of friendship”, brought back from the meeting in Kolkata, recalled our communion with other young people of the whole world. On Saturday evening, just before departure day, the Christians of the village, children, young people and older people, had all been invited to come to join the young people for a very beautiful community prayer. Then, after the evening meal, a great moment of celebration brought together on the illuminated square in front of the Church a crowd of inhabitants from the village, Moslems, Hindus and Christians all together. On an improvised stage, there was a joyful spectacle - of songs, recitation of poems, and traditional dances - prepared that day by the young people from different villages who had come for these three beautiful days of meeting.